Design question! I would desperately love some nice window treatments for my old house, but at some point mid-century, my old house was retrofitted with these flat-against-the-wall-type radiators. It's a colonial with small rooms and lots of windows, but that also means one or two windows in every room have a radiator under them. These bad boys never heat up enough to actually BURN a drape, but I'm wary of that. It also gets ridiculously cold here, and I don't want to block the heat. Right now, we have lovely 2-inch blinds in every room we're sick of. My rooms feel so unfinished! WHAT DO TO?! So glad you asked, Andrew! A lot of people have this problem, and there are a couple of options for your dilemma. 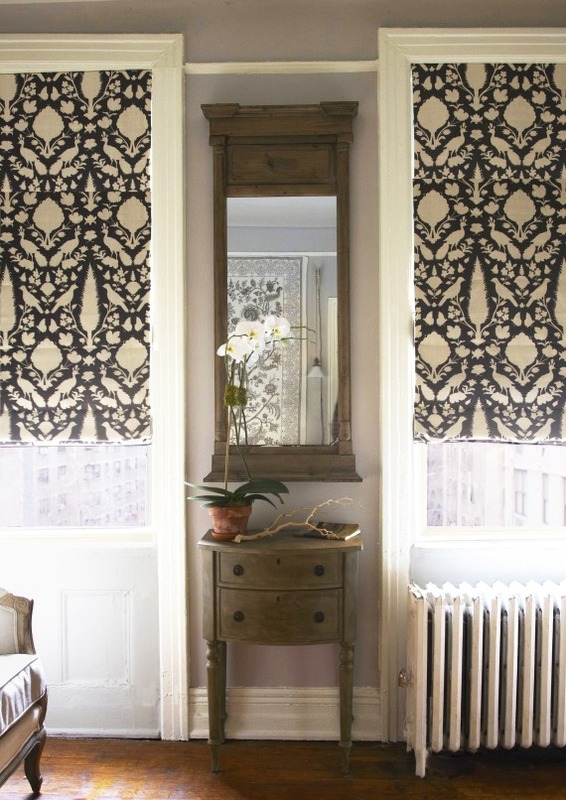 First, I'd look at installing roman shades or bamboo shades instead of curtains/draperies. I do love a dressed-up bamboo shade -- and this type of shade is great for letting light in while still maintaining privacy. Even plain white roman shades can look finished and beautiful when implemented correctly. Another option is to throw caution to the wind and go with the draperies you really want. According to my main man Nick Olsen, cotton fabric has a higher flash point than your radiator's steam heat maxes out at (The numbers I researched vary -- and by research, I mean "searched on Google" -- but the general consensus is that cotton fabric ignites at several hundred degrees more than a radiator can manage.). As for the heat-blocking issue, you can always combine shades and curtains so that you still have privacy when the curtains are open, to allow for heat to escape. Plus, as I told my campers yesterday, shades and drapes in combination look really nice and layered and texture-y, and also like a rich old lady's house. I know your dream in life is to feel like a rich old lady, Andrew. If it were my place, I would order the combo platter and never look back. Thanks for writing in, and let us know what you decide! PS. Andrew also would like to know about good Etsy clothing recommendations for men that aren't graphic t-shirts. If you have any, leave them in the comments! All photos via Lonny Magazine except the first one, via Sara Lowman Interiors. Newer:News Flash: Camp NotesOlder:NYC Design Camp, I miss you already.